No Guns Please, Starbucks Tells Customers : The Two-Way The coffee giant has been wrongly portrayed, it says, as being a champion of "open carry" laws. Now it's asking customers not to bring weapons to its shops. 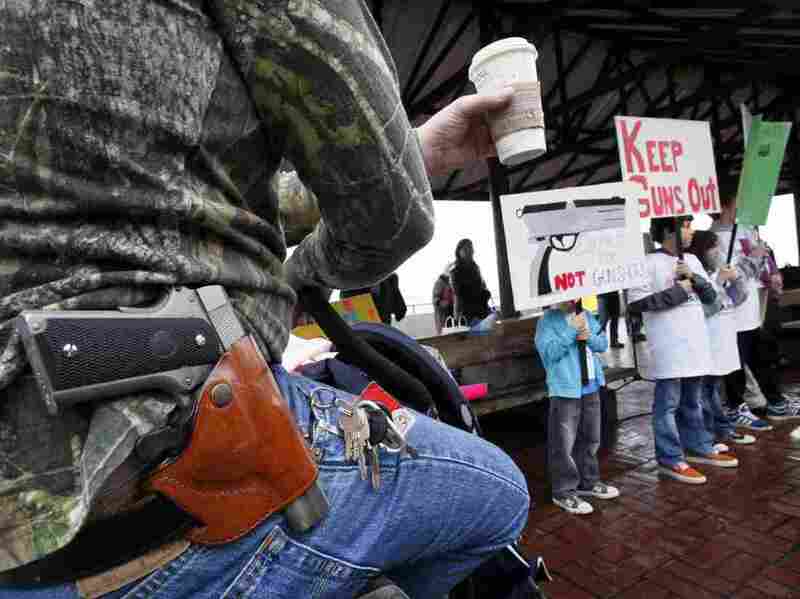 A Starbucks customer — gun on his hip and drink in his hand — watches a rally by gun control advocates, in Seattle in 2010. With the coffee giant caught in the middle of what he says is an "increasingly uncivil and, in some cases, even threatening" debate, Starbucks CEO Howard Schultz has posted a letter to "fellow Americans" asking that they not bring guns into Starbucks' shops. "Our company's longstanding approach to 'open carry' has been to follow local laws: we permit it in states where allowed and we prohibit it in states where these laws don't exist. We have chosen this approach because we believe our store partners should not be put in the uncomfortable position of requiring customers to disarm or leave our stores. We believe that gun policy should be addressed by government and law enforcement — not by Starbucks and our store partners. "Recently, however, we've seen the 'open carry' debate become increasingly uncivil and, in some cases, even threatening. Pro-gun activists have used our stores as a political stage for media events misleadingly called 'Starbucks Appreciation Days' that disingenuously portray Starbucks as a champion of 'open carry.' To be clear: we do not want these events in our stores. Some anti-gun activists have also played a role in ratcheting up the rhetoric and friction, including soliciting and confronting our customers and partners. "For these reasons, today we are respectfully requesting that customers no longer bring firearms into our stores or outdoor seating areas—even in states where 'open carry' is permitted — unless they are authorized law enforcement personnel." Time writes that "while the company is planning to run ads in major U.S. newspapers on Thursday asking customers to avoid bringing guns into the store, Schultz says no official ban will be instituted." Baristas apparently won't try to deny service to gun-carrying customers and won't ask them to go elsewhere. The Associated Press says it was "provided a picture of a memo to Starbucks employees on Tuesday. Partners are instructed not to confront customers or ask them to leave solely for carrying a weapon." National Journal wrote back in August about how thousands of customers were planning to bring their guns along for a "Starbucks Appreciation Day." Several posters on the "Starbucks Appreciation Day" Facebook page are upset about the new policy. The AP notes that "several companies do not allow firearms in their stores ... apparently with little trouble. Representatives for Peet's Coffee & Tea and Whole Foods, for example, said there haven't been any problems with enforcing their gun bans."